The Trinidad and Tobago Carnival is an annual event held on the Monday and Tuesday before Ash Wednesday in Trinidad and Tobago. 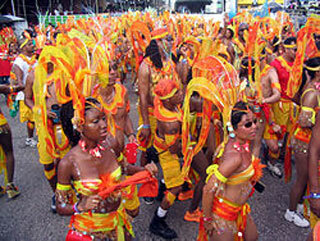 The event is well known for participants' colorful costumes and exuberant celebrations. The Mas tradition started in the late 18th century with French plantation owners organizing masquerades (mas) and balls before enduring the fasting of Lent. The slaves, who could not take part in Carnival, formed their own, parallel celebration called "Canboulay". Canboulay (from the French cannes brulées, meaning burnt cane) is a precursor to Trinidad and Tobago Carnival, and has played an important role in the development of the music of Trinidad and Tobago. This article uses material from the Wikipedia article "Trinidad and Tobago Carnival", which is released under the Creative Commons Attribution-Share-Alike 3.0 License.